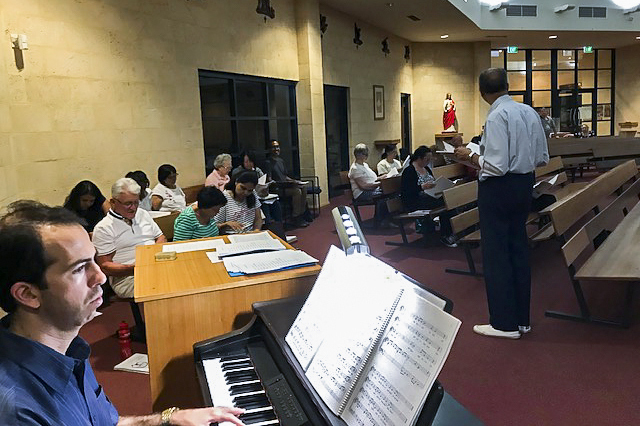 Six parishes from the Catholic Archdiocese of Perth participated in a four-session Psalmist Training course which ended on 7 March. Photo: Supplied. The course that was divided into four sessions, was a collaborative effort by the Archdiocesan Centre for Liturgy (CFL) and the South East Metropolitan Musicians Network Committee. Participants had the opportunity to explore Scripture, where they delved into Scripture studying the Book of Psalms, and its’ significance in Eucharistic celebrations. They were also introduced to a voice production and repertoire session. During this time, the psalmists were taught how to sing a psalm each, and presented in front of all the other participants. Sharing their knowledge with attendees were the CFL Music Consultant, Chris deSilva, assisted by CFL Music Field Officer Alessio Loiacono. The pair were supported by Frank Waring, Deirdre Wright and Suzanne and Stewart Bazzica. St Francis Xavier Church Parish Priest Fr Joseph Tran attended the final session, commending the participants for their interests and service to the Church. Fr Tran then presented the participants with their certificate of participation. The participants will exercise the Ministry of the Psalmist in their respective parishes. The Centre for Liturgy will run another Psalmist Training Course in Nollamara in June this year. For further information please contact the Centre on 9207 3350 during business hours.